Golf courses offer a number of employment opportunities and are especially attractive for those who have a genuine passion for the game. There are a variety of possible jobs at golf courses, ranging from golf instructor to sales clerk to the laborers who cut the fairways and greens. However, there are only a few jobs that offer potential careers, with opportunities for solid advancement in position and pay. Most of these jobs require special training and skills, and some require specific certifications or college degree programs. The person who oversees the entire operations of the golf course is the general manager. He hires and manages staff, oversees the budget and implements marketing plans. At some courses, the general manager is also a PGA teaching professional. According to a number of job websites, as of 2010, a golf course manager's salary generally ranges from $60,000 to $100,000 annually. 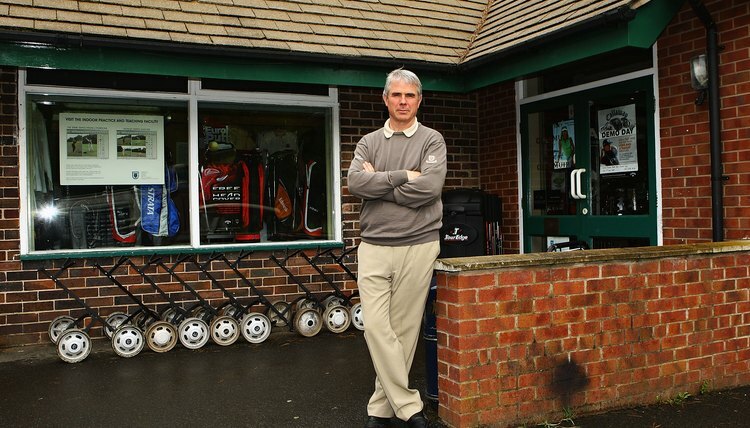 The golf course's head pro usually oversees the golf shop operations and the golf teaching staff. She is almost always a certified class-A PGA professional and generally has been an assistant professional or a staff teaching professional at a golf course or driving range. According to the PGA of America, as of 2010, a head pro's yearly salary can range between $35,000 and $100,000. PGA teaching professionals are sometimes called assistants and work underneath the head pro. Many of them teach, work in the golf shop and coordinate golf course events and tournaments. These staffers are many times certified PGA professionals or in the PGA apprentice program. Job websites estimate annual pay at between $25,000 and $60,000 as of 2010. To become a golf course superintendent, or head greenskeeper, you must have an education in agronomy or turfgrass management. The job is to take care of all the different varieties of grasses, trees and shrubs on the golf course, to manage the landscape crew and to handle the obstacles (heavy rains, storms, obsessive heat) Mother Nature may bring. The superintendent also oversees the budget for care and maintenance of the course and grounds. The Golf Course Superintendents Association of America says a head greenskeeper with a a good reputation and years of experience can make a six-figure salary as of 2010. Mainly at private golf clubs, someone is needed to oversee caddy operations, train caddies and coordinate caddy work. That person is the caddy master. His biggest job is to manage the course caddies, coordinate their work schedules and develop training programs for the caddies. According to sports and recreation job websites, a caddy master can make between $20,000 and $40,000 a year as of 2010. To help manage tee times and player start times, and to help facilitate play around the course, golf clubs hire starters and rangers. The starter is the first tee's gatekeeper, managing the tee times as players begin their rounds. This position requires organizational skills and a personable demeanor, as starters welcome golfers to the course. Rangers manage play around the golf course by keeping tabs on pace-of-play and helping assist players with such things as misplaced clubs or a lost ball. Many starters and rangers are paid on an hourly scale. If the golf course has dining, bar or banquet facilities, there is likely a position for someone to manage this part of the golf club's operations. The food and beverage manager oversees dining and food budgets, orders needed supplies, manages food staff and helps to coordinate special course events, such as golf outings. She may also work as a sales associate to help promote the golf course's dining or banquet facilities.